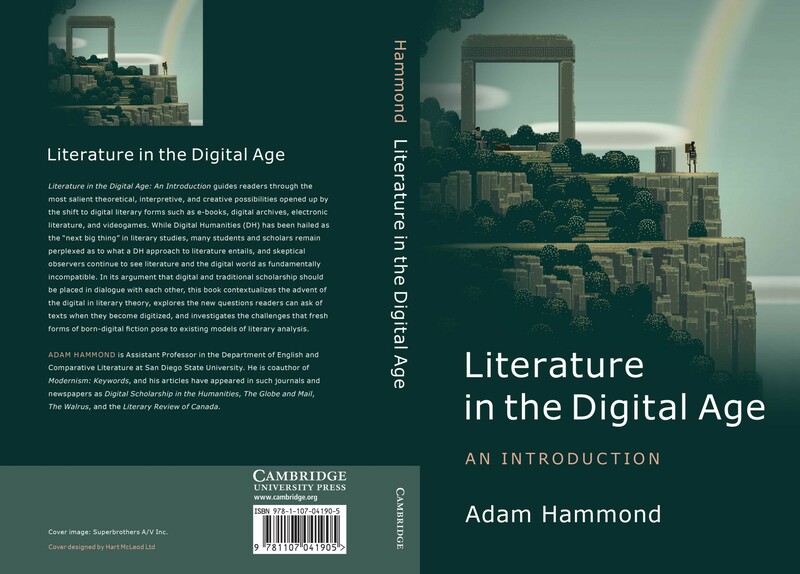 My book Literature in the Digital Age: An Introduction was published by Cambridge University Press in March 2016. It aims to introduce a broad audience of undergraduates, graduate students, and faculty in literature departments to the most salient theoretical, interpretive, and creative possibilities opened up by the shift to digital forms. The book’s structuring idea, derived from Mikhail Bakhtin’s ethical philosophy, is that digital and traditional scholarship each possess an “excess of seeing” with respect to the other, and must be placed in dialogue. I situate the advent of the digital in the context of literary theory; explore the new literary questions we can ask of texts when they are digitized; and investigate the challenges that new forms of born-digital fiction pose to existing models of literary interpretation, particularly narrative theory. If you are interested in using the book in the classroom, I have put together a detailed guide to teaching with Literature in the Digital Age, featuring a unit-by-unit breakdown, sample syllabi, and sample assignments. In future I’d consider assigning @ahmmnd‘s book for general Intro to Literature courses, not just courses focused on digital media or DH. Literature in the Digital Age is a featured selection in the 2016 Cambridge Literature catalogue (see featured authors page and p. 3).